I first caught a glimpse of Becca's fall promo pictures in July (if you didn't catch it, mosey on over to their website) and was smitten by the dark berry gloss featured on one of the models. 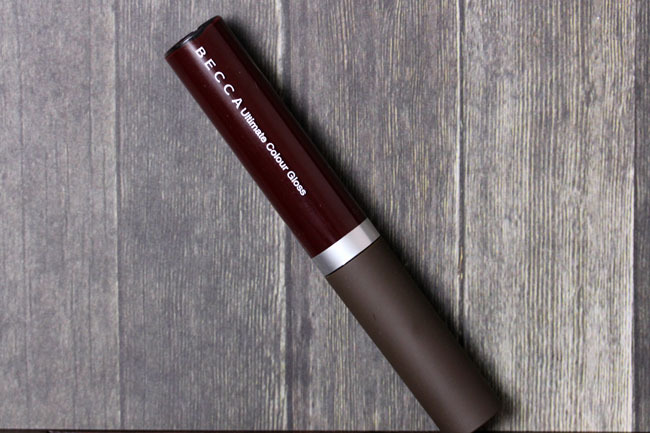 It caused a frenzy among a few of my beauty blogger friends as we dug around for a comparable shade, and just couldn't find one quite like it. Now, it's finally available, and in my possession. I've waited three months to try this, you guys. That's pretty high on the expectation front. Becca Berry Twist Ultimate Colour Gloss swatches nothing like what you see in the tube or on your lips. It's kind of a weird creature, if you ask me. 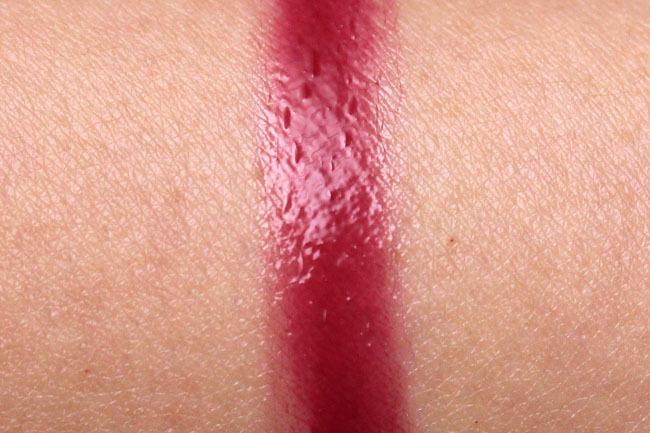 What you see on your arm is what I think of as a happy berry shade, while on lips it's a deep plum, even with one swipe. I'm glad, because it's exactly the color we were looking for. This is the first time I've tried a gloss from Becca, but I feel like it's the start of a happy new relationship. The gloss smells like melted marshmallows in the tube but the scent dissipates when applied to the lips. It's moisturizing, long-lasting but weightless, highly pigmented but doesn't stain or bleed - what's not to love? 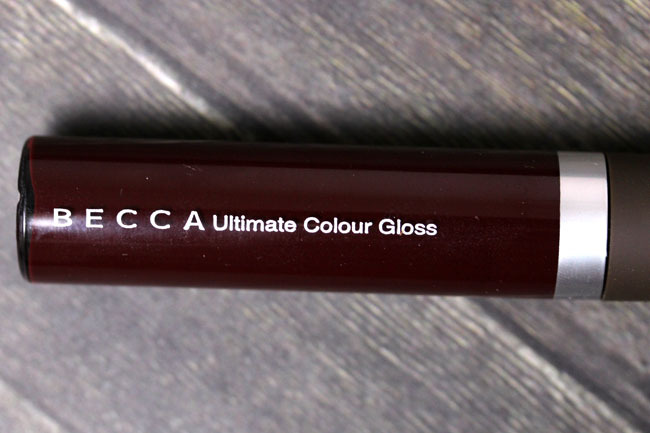 Becca Ultimate Colour Gloss in Berry Twist retails for $24 and is available at beccacosmetics.com. In case you missed the announcement, Sephora recently started carrying Becca Cosmetics as well. 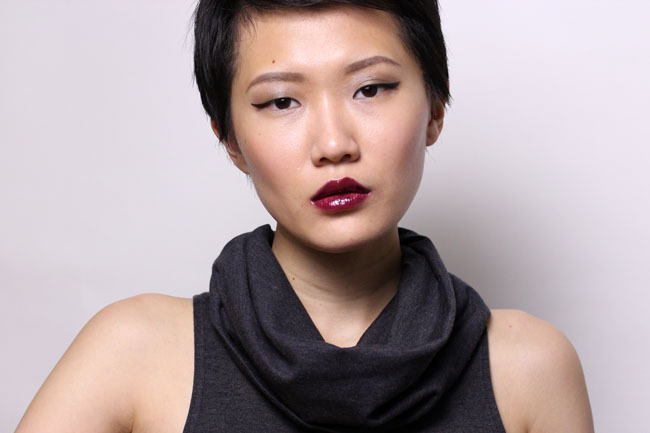 On a side style note, I've been enamored with cowl necks this season! I haven't done my fall wardrobe update yet but I can't wait to get a few new sweaters to keep warm in what I predict will be a ghastly winter. I'll need things with major neck protection with my new haircut. Also, I tried, but turns out I can't stop harping about Chanel Notorious (sorry). I used it on my eyes because the cat-eye felt bare paired with the intense lip, and turns out it looks pretty good there too. Seriously, do I need a back up? Hallo! I like your haircut and this lipgloss suits you so well! Looks so stunning and vampy! Meow! You look really gorgeous - I love the way you styled your new cut today. 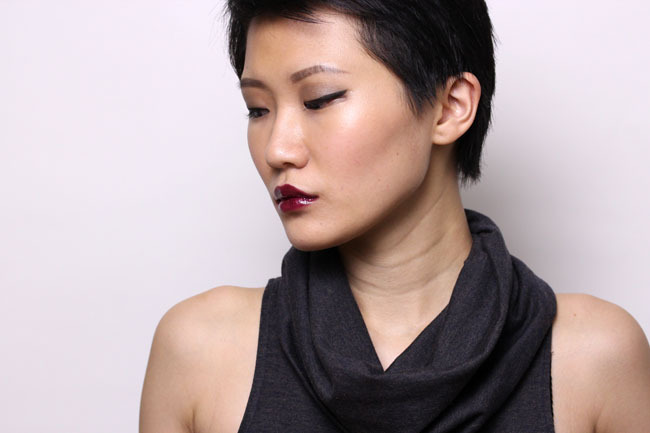 The Becca gloss is indeed pretty but I think I still prefer the Dior Black-Tie Plum on you. I love pixie hair. IMHO this styling is the best one since you chopped your hair. this looks amazing on you with your dark grey top. Anyway, you look wonderful with short hair, really brings out your amazing facial structure! Aw :( You could try calling the US boutiques to see if they ship to Canada? I think Saks did it for someone. You are bee-yoo-tiful, Wandz! I wants it. Stunning! Thanks to you, I want Notorious and this gloss so badly - and I'm not even a gloss person. You fierce thing, Xiao!!! I remember the frenzy, and I'm glad you finally laid your hands on it! Becca is one of my favorite independent companies out there, and I've had positive experience with all of my purchases. Can't wait to see these on Zuneta! This is gorgeous on you! And perfect paired with your dark grey cowlneck top. Your timing couldn't have been more perfect to post about these glosses - I was just wondering this weekend if there were any posts out in the blogosphere on these. The last thing I need is another deep berry ... and yet this is just so BEAUTIFUL on you! I need, I need, I NEED! Jessica, this would look phenomenal on you!! Such a sumptuous shade - would you say this lasts better than Dior Black Tie Plum? And I approve of cowlnecks. How about a turtleneck too a la Audrey Hepburn? The difference is BTP has shimmer and the Becca is a doe-foot. I'll give preference to the latter just because of that. Also, the turtlenecks will come out soon, as the weather worsens! Can't find notorious online :( it's probably sold out bc it's LE? I basically just want to keep looking at your hair. The lipgloss is also great. 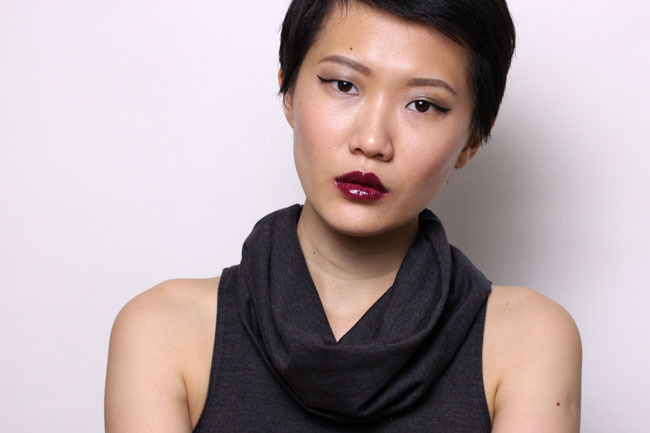 (A propos of cowl necks, have you also considered the square neck and the boat neck? Very good with the pixie: cf Jean Seberg here: http://alisonkerr.files.wordpress.com/2010/09/pixie-jean-seberg.jpg and http://3.bp.blogspot.com/-ccUh-cmxvlc/TnXXwa8BFqI/AAAAAAAAAGM/TsQLUgqhzDU/s1600/breathless_l1.jpg).